In the early days of brewing, multiple step infusion mashing was the rule, not the exception. During that time, poorly understood malting and kilning processes rendered malted barley without ample enzymes for proper saccharification. These undermodified malts are nearly extinct nowadays, as is multiple step infusion mashing. But history still has its place! Unfortunately, my 10-gallon electric brewery does not allow for step mashing, yet. Therefore, for the past six years of homebrewing, I have largely ignored step mashes altogether and despite thorough reading, I have never fully understood the concept. Not until now, anyway. Heat main mash liquor and dough in … aiming for an initial temperature of 131°F … for around 15 minutes. Raise mash to around 145°F. Keep at this temperature for 40-50 minutes. Raise mash to 154°F. Keep at this temperature for 20 minutes. After some research, it turns out that Browne deliberately utilizes a beta glucanase/ferulic acid rest, proteinase rest, beta amylase saccharification rest, and alpha amylas saccharification rest. Each step serves a specific purpose in his saison recipe (and any brewer’s recipe for that matter). Brasserie Dupont pushes step mashing into extreme territory with its Saison Dupont, mashing in at 113°F and gradually raising to 162°F over ~90 minutes! Brulosophy was even able to demonstrate the benefit of step mashing in a simple blonde ale, implying that many beer styles may benefit from a step mash. Ready to try a step mash for yourself? Check out the infographic and summaries below to learn more about the seven most common rests, including Browne’s. Phytase is one of many enzymes naturally found on grain. At temperatures of 86-126°F, phytase converts phytin to phytic acid, thereby lowering the mash pH to a suitable range for brewing. Due to its heat susceptibility, phytase is only present on very lightly-kilned malts. The conversion process is slow, requiring at least 60 minutes for meaningful pH change. Traditionally, a phytase step was used for undermodified pilsner malts in soft water profiles with little buffering capability (i.e Czech Pils). Today, food grade acids or acidulated malt can be used instead of a phytase step. Beta glucanases are enzymes responsible for degrading beta glucans, carbohydrates found in the protein layer of starch molecules, which can gum up a mash and lauter. The active temperature ranges for beta glucanases is 95-113°F, with 113°F representing the optimal temperature. Beta glucans are found in highest concentrations in adjuncts such as wheat, oats, and rye and can lead to haze if not properly degraded. A brief 15 minute rest is sufficient. In fully modified malts, beta glucans should not be a problem, however any beer containing >25% adjuncts could benefit from this rest. Ferulic acid is a precursor to 4-vinyl-guaiacol (4VG), an ester responsible for clove-like qualities in beers like hefeweizen. Within a narrow temperature range of 109-113°F, large quantities of ferulic acid is released. This step works best in a mash pH of 5.7-5.8, therefore its best to perform the ferulic acid step before acidifying the mash for saccharification. A short, 10 minute rest will allow for substantial release of ferulic acid. Peptidase is one of two proteolytic enzymes involved in the “protein rest.” It is responsible for segmenting medium-length and short-length protein chains, breaking them down into component form. Peptidase is most efficient between temperatures of 113-128°F, but be careful not to overdo this step; too few medium-length protein chains can leave your beer lacking body. A 15 minute rest is sufficient for optimal body and foam retention. Proteinase is the other proteolytic enzyme. Similar to peptidase, proteinase also segments protein chains, however its goal is breaking long-length chains down into medium-length ones. This is a beneficial process because it helps eliminate haze and instability in the beer. The optimal temperature range for proteinase is 131-137°F and it benefits from a 15 minute rest. 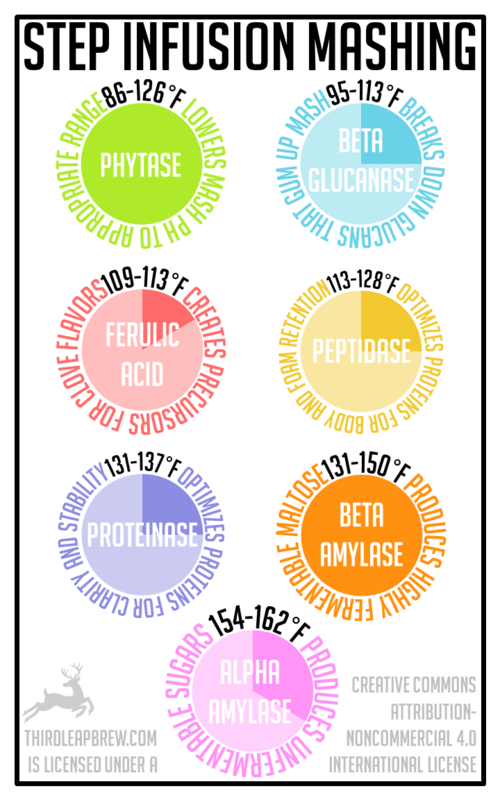 Beta amylase is a member of the diastatic enzyme family. It functions to attack the ends of starch molecules by snipping off sugar residues to produce maltose. Maltose is highly fermentable by Saccharomyces, and is the main constituent in wort. Beta amylase is most active between 140-145°F and it benefits from a long (60+ minute) rest to produce highly fermentable wort for drier beers, like saison. Alpha amylase is the second diastatic enzyme. It is responsible for altering starch molecules into unfermentable dextrins by attacking random points along the chains. Higher saccharification rest temperatures (155-162°F), result in a less fermentable wort, and therefore a sweeter, more full-bodied beer. A short 20 minute rest in a thick mash (1 qt/lb) will do the trick. Do you have a favorite step infusion mash schedule? Let me know in the comments below! A well written article – good info and to the point! Answered all my questions about the ideal step mash schedule for a home brewed Saison and the reasons behind them. It seems to me that the Beta Glucanaase (acid rest) can be avoided unless you have a particular need for it. Thanks Damon. I am glad this was helpful for step mashing your homebrewed saison. The Beta gluncan rest can be avoided in most instances, unless you have a very high percentage (>25%) of wheat or other adjuncts. In reality, you can probably avoid a beta glucan rest altogether (even with lots of adjuncts) since lautering is typically easier and more controlled than on the commercial scale.